Due to extending the exam board schedule we need to move the date of the newly renamed Staff Development Conference to Weds 10th July. We will be using the wonderful facilities of Mithras House (Chris and Max have promised to make the rooms attractive) and the multi storey car park should be open by then. We will follow the conference with a get together in the Bevy . The agenda is broadening out to include more than just developments in Learning and Teaching this year. Staff will be presented with the Annual Learning & Teaching and Professional Staff awards 2019. We will also be welcoming members of SASM who will be service teaching Events and Tourism at BBS from next academic year. The programme is being developed currently and as in prevous years we want to offer what you want. If you feel you would like to contribute a session please let me (Julie Fowlie) or Chris Matthews know. 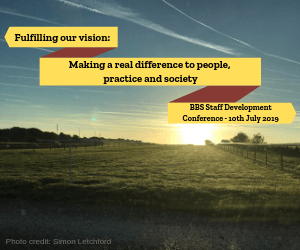 BSS & NSS Launch: Developmental Feedback and more….. The BSS and NSS launch on the 4th Feb. It is vitally important that as a school we pull together to support these important surveys. The result of the NSS will feed into the subject level TEF. The first three weeks of the NSS are critical as after that time Ipsos will then start to call our students and we know that frustrates them, however it is out of our control. The Student Engagement Champions have organised 3 NSS Pizza Nights to encourage students to come and complete the survey. These will be on 5th, 12th and 19th Feb from 5-7 in Mithras Canteen. If you can not open the link please me me know and I will send them by email. Finally for now following a very successful 2018 Graduation Ball the tickets for 2019 Graduation Ball will be on sale very soon. The ball will be @The Grand Hotel on 7th June. Why is peer observation so beneficial? • identifying generic development needs, to feed into ongoing and future staff development activities. Adapted from: Race, P. et al. (2009) Using peer observation to enhance teaching. Fellowships are underpinned by the UK Professional Standards Framework for Teaching and Learning in HE (UKPSF). This could be a consideration for promotion. Essentially, it’s confidential between you and your observer. The scheme for peer review is not connected with the formal process of a Staff Development Review (SDR). That said, you may well wish to use feedback from your observer as evidence of your good practice in your SDR the choice remains yours and as noted above as part of a HEA Fellowship or promotion application. A pre-observation meeting enables the observed member of staff to identify the aims and context of the session. In addition; this meeting cam be used to agree the specific aspects of the session the observer will focus on – and whether they will also comment on other aspects not specified in advance. whether or not they will interact with the students at any point (we recommend that normally they don’t take an active part in the session). Normally, during the observation, you should run the event as any other, and it is recommended that the observer does not take an active part. This ensures the observer is able to give close attention to the way you and the students are behaving, making brief notes using the template. This is a vital part of the peer observation because, as explained earlier, the purpose of the process is to enable both of you (observer and observed) to gain insights from a discussion of your shared experience. Begin by discussing the specific aspects you selected as the focus of the observation, using the observer’s notes to start the conversation. consider how any constraints on learning could be avoided or overcome. Below is the link to the NSS and BSS questions. The BSS questions will be different this year. Below is the link to the action plan which was distributed with some additional comments made as a result of the recent ESEC meeting. The link to the Action plan will take you to the most current document, so as we make changes it will be updated. You can find all the relevant Business School documents about the NSS/BSS on SharePoint. To find the folder, go to staffcentral then click arrow to the right of your name, then click “my department”. You will see headings across the top: click on NSS and the documents for 18/19 are in subfolder. What is difficult is getting out the good news/changes to students and staff and building a sense of positivity and pride. We have Your Voice Matters on studentcentral on the main menu for MySchool Brighton Business School. This includes responses to students’ stop, start and continue feedback, a link to the Good News Stories and student comms re 2018 BSS. One simple way to promote the survey is to add a strap-line to the signature area on emails (see below) as we are often solving problems and answering questions – this reinforces that we are supporting students. Staff and students have had access to the Learning Dashboard for a number of weeks now. 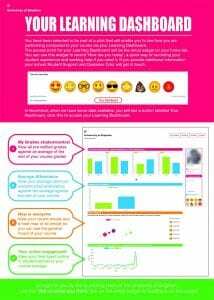 Learning Analytics data summary so far for BBS shows students’ emoji usage and the frequency of visits for both staff and students to the Learning Dashboard. The report also includes some of the free text comments students have made using the emoji widget, these are from students across all schools in the pilot to help protect their anonymity, however it is useful to read a flavour of the comments being sent. One of the things that is important is to capture attendance through the use of the photo registers. It’s great to see that students are using the tools we’ve made available to them. Marion and the team plan on starting the evaluation process towards the end of this semester and we will determine the best method. They have already received some feedback about the photo registers including some feature requests which are being collated and added to the staff feedback process for you to comment on. Please feel free to get in touch with Marion Curdy M.E.Curdy@brighton.ac.uk or Julie Fowlie j.fowlie@brighton.ac.uk if you have any concerns or queries at any point. As we head towards the season of goodwill, we wanted to support some great causes whilst also having some festive fun. 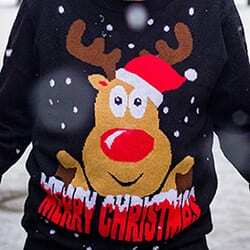 It is easy to get involved: Simply dig out your favourite festive jumper, wear it to work on the 12th December and donate £2 or more. You do not even need to splash out on a seasonal sweater to take part – just grab a plain jumper from your wardrobe and customise it using tinsel, baubles and homemade snowflakes! Just send a text message saying BRJU18 £2 to 70070 to donate £2 by text, or to donate £5 send the code BRJU18 £5 – you can also make a donation via our JustGiving site. Money donated will help to build a better and brighter future for children who are in desperate need. Funding will be equally split between The University’s Malagiri School Project in Nepal and the Save the Children Christmas Jumper Day Appeal. Don’t forget to tweet your festive pictures to @brightonalumni using the hashtag #brightonforever. The release of the dashboard may trigger student queries about discrepancies between the data shown and their own records of attendance. We appreciate your help in reassuring students that this is pilot data which will not be used to assess them in any way. As a reminder, this based on the attendance we are recording so again it is really important that we all use the electronic registers. Average cohort data in particular may be skewed, for example as a result of different register taking practices by different seminar tutors. Remember that Course Leaders and Personal Academic Tutors can use the Student Lookup via studentcentral to click through and access the dashboard and should start using this in PAT sessions. The third annual Learning and Teaching & Professional Staff Awards are open for nomination from the 5th November. The Business School has a proud record of recognising and rewarding its teaching and professional support staff. This year we will be presenting a total of eight £250 awards: four for Learning and Teaching and four for Professional Support. New for 2018/19: one of the Learning and Teaching Awards has been co-sponsored by the BBS student Law Society, so if you want nominate a Law lecturer please use the separate form. The process of entry is by anonymous nomination on-line. Please scroll down to the page to view all entry forms. Nominations can be made by students or staff colleagues. The emojis are getting going – over 200 emojis recorded so far! 🤓 (clever) is winning – a good sign for the new term. Photo Register is working – around 5000 students university-wide are having their attendance recorded each day! 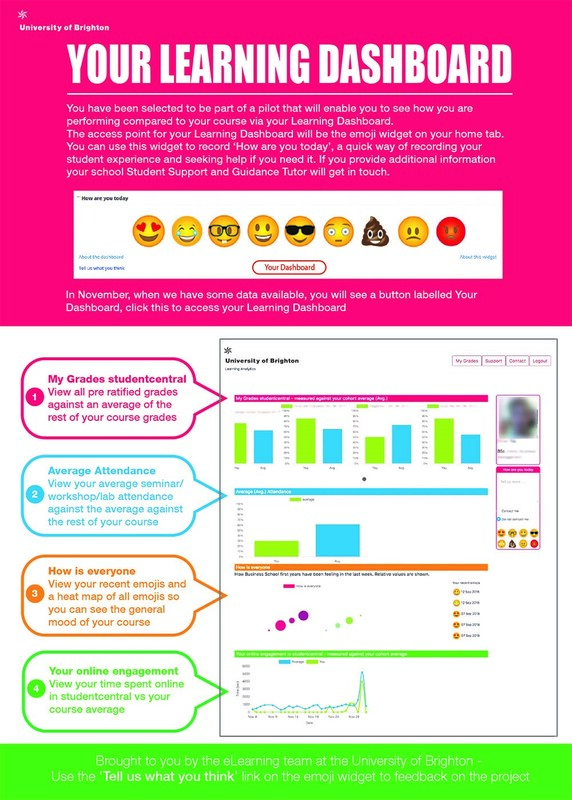 As a reminder, the full dashboard will be released by Mon Nov 5th – for students this is via a dashboard button on the emoji widget and for Personal Academic Tutors and Course Leaders this is via the Student Lookup tab on the top right hand side on studentcentral. Doctoral students who are teaching don’t see photo register (only ‘staff’), Katie and the team are aware of this. Once we understand the scale of this as an issue we will find a solution.